In most of the cases salary certificate issues without a format. Salary Certificate letter must contain some necessary information related to an employee's salary break-up including the tenure. Generally, Salary certificate uses for submitting to financial institutions sanctioning loan request made by salaried employee. It will give a basic assessment of an employee's repayment capacity prior sanctioning loan amount. A Salary Certificate is an Official document that must contain an employee's monthly total earnings, monthly total deductions, their break-ups and a summary of net salary received during the month. It should capable to express the financial position of the employee along with identity details, position and remaining years to retirement. You are advised to read the differences between salary certificate and salary certificate letter here. 1. 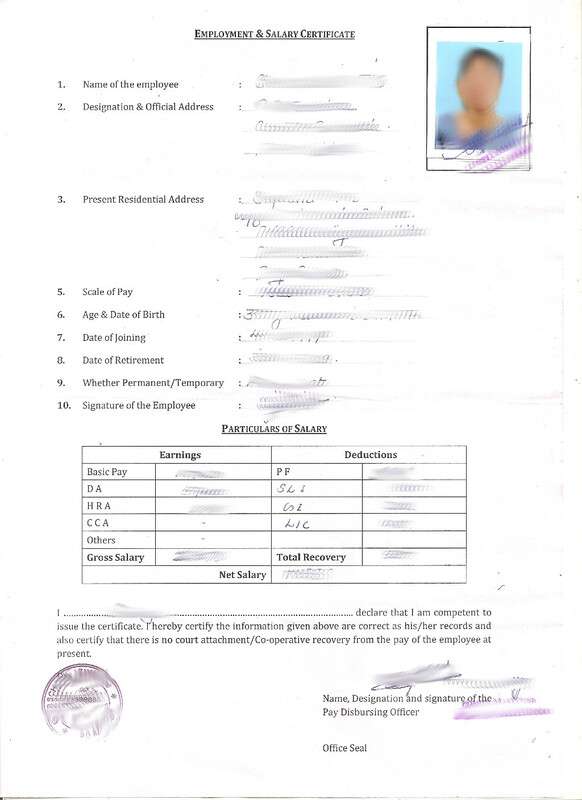 Under this head, salary certificate form shows the amounts an employee is entitled to get, from the employer. 2. 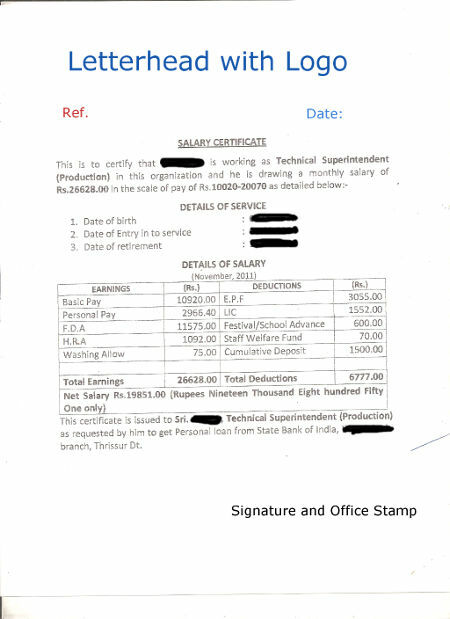 Salary certificate shows the Gross Salary amount, which will be the sum total of all the figures. 1. Under the Deductions head, salary certificate letter shows all the figures of sum that are required to be deducted from the salary, like Income Tax and other taxes to be deducted at source also known as TDS, installments of loans / advances repayable by the employee, provident fund contributions etc. 2. At the end of the section of the salary certificate letter, show the sum total of the deductions. And finally, the Salary certificate must have net salary to be paid to the employee, which is the Gross Salary minus the Total Deductions. 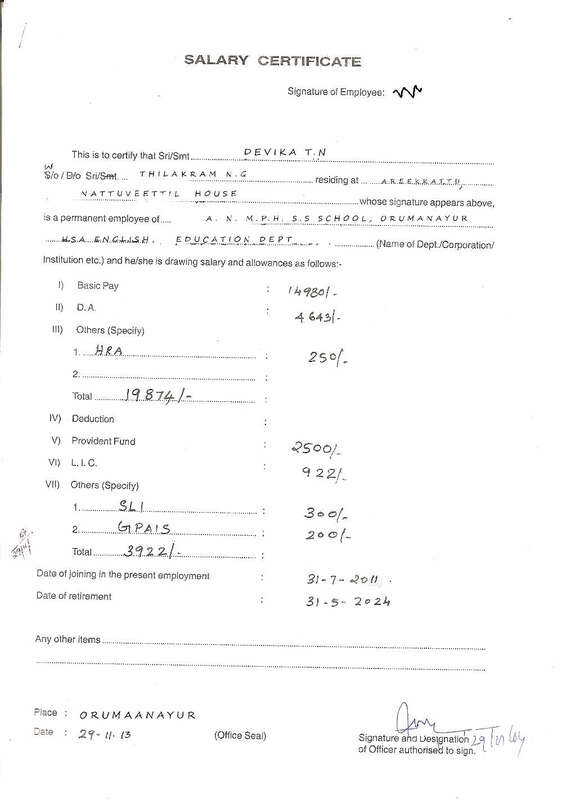 Attached image given explains the format of salary certificate issued for a car loan from bank. This Certificate of Salary shows gross earnings and deductions but not shown net earnings separately. This sample Certificate of Salary letter shows Gross earnings, Total Deductions and Net Salary. Other important data shown in this format are: self attested photograph of the employee, designation, addresses, scale of pay, date of birth, date of joining, date of retirement and whether permanent or temporary. This Salary certificate can be considered as comprehensive and ideal sample salary certificate for any purpose. 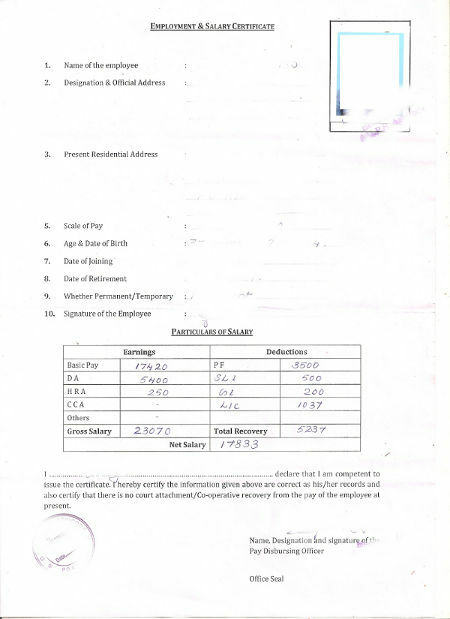 The download link has this Salary certificate form to be used for any purposes. When you apply for a bank loan, most of the banks ask you to produce some of the basic documents along with the loan application in which the important documents are: KYC documents (photo, address proof / Ration Card, ID proof, Passport), certificate of salary or salary certificate / latest salary slip showing all deductions and TDS certificate - Form 16 in case of you are a salaried person. Some of the offices have restrictions to issue certificate of salary more than once in a financial year. In such cases, photocopy of last certificate of salary, 3 months salary slips and TDS certificate would be the solution. Do you want Salary certificate formats that can be edited as you like? Here you can download MS word (.doc) and Excel (.xls) Files for making your Salary certificate. In addition to above Mr. / Mrs. is entitled to bonus of Rs. ----------- and LTA of Rs. ------------. We hereby declare that we have deducted income tax of Rs. ------------- from Mr. / Mrs. ---------------------- --------------------- emoluments and same has been deposited in ------------------------ Bank branch. This salary certificate is being issued to him on his ---------------------- ----------------- request. I already taken a car loan using my slary ceritificate now i want to apply for a home loan. When i enquire it, iam informed that deductions will have car loan emi. sothat my eligibility for home loan is very low. In this condition how i will get maximum home loan amount? How much amount I require for the living expenditure without borrowing from other source. Normally Banks should know this point because, after taking loans from bank, you should not be starved or become a begger for your daily activities. Bank always calculate EMI/NMI ratio which should not be greater than a pre-defined value. Nationalized Banks normally take this value between 40 to 60 depending the Net Monthly Income. If you have higher NMI and has some liablities, Bank will further deduct that value from NMI. You change the payment method for car loan as cash payment instead directly deducting from the salary. This way you can hide your car loan liabilty from the salary certificate and increse the net earnings. If you give your present liabilities, NMI, home loan duration, amount required and retirement date, I can precisely say how much amount you can avail for home loan. Nice post! Every employee should atleast read this post. Sample images describe all the details a salary template must have. Great work! what is the limit of amount given to an employee? what is the time period between two salary certificates? Normally an employee is entitled to get his Salary certificate once in a year. In some organization, it will be given upto 4 in each quarter year gap. It depends the policy of the company / organization, nothing else. Many financial institutions accepts Salary slip instead of Salary Certificate as a supporting document for loan application. In such cases employee can apply for 12 loan applications! Do you think that he/she get loans from all those institutions? In most cases, the third or fourth institution could recognize the employee's purchasing power has been reduced to below permissible level or even to zero, hence, repayment may not be carried out. In such cases, loan application will be rejected. It is considered to be salary as cash payment, deposited in the bank account every month by the beneficiary itself. Get salary certificate from the company with all earnings and deductions if any, then apply for home loan. There seems no issue at all. The property title should be in the name of husband otherwise a co-borrower (wife, or close relative) needs to be joined. Salary certificate should reflect your total earnings. The amount you receive as cash may not be accountable, means black money which can't be shown in a salary certificate. If you get salary certificate with 100% earnings, there is no issue at all but I doubt your company will issue salary certificate in such a manner since they hesitant to pay you 100% to the bank. Try this way: Close your personal and two wheeler loan, then apply home loan by both of you through a joint account. Salary Certificate Format: If your organization doesn't have specific format for employee salary certificate, download this format and use it. Shall I consider "recently" means less than 6 months? If yes, wait till completion of one year. Nationalized banks normally seeks three years service from present job, but if you can provide two years IT return with progress in the career, they may consider even one year. Other new-gen private commercial banks at-least require one year. If you are in Govt. / semi Govt. sector, banks will allow further relaxation. Giving salary certificate before completing one year depending upon company's policy. As i want a salary certificate which i receive in cash. At present I am on rent basis having my two kids one is in cs 3rd year and second one in 12th and I want to purchase a Flat have a value of 24 lakhs with registry it will arround 28 lakhs on which I want a loan ammount of approx. 20 lakhs. Please guide and dictate the same. I am in hurry. Whether you get cash or check or any other means, what is the harm to get salary certificate from your employer? Apply for a salary certificate without hesitation.